Moroni then put the title of liberty on a pole and "prayed mightily unto his God for the blessings of liberty to rest upon his brethren." Then he ran around the countryside hoisting the banner to recruit people into the defensive army against the Lamanites. I don't agree with violence for the sake of violence. The key here is that LL Cool J beat the snot out of the intruder for his family. That's cool with me. 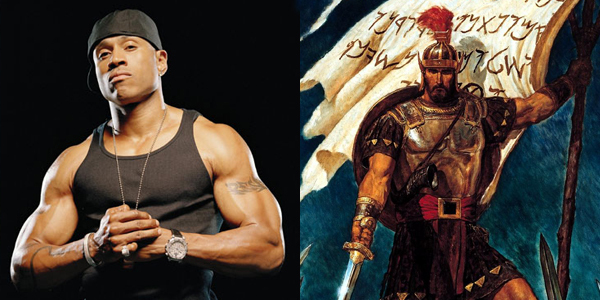 Not to extoll the virtue of LL Cool J too much, but it appears to me he was acting/reacting for the right reasons, just like Moroni, who became a major player in a bloody and relentless war. I hope I would be able to do the same if anyone ever threatened my family in such a manner as either Moroni or Mr. Cool J encountered. Speaking of which, the closest I have ever gotten to this is when a drunk guy who slept in my unlocked car tried to walk into my locked house before 6 a.m., not seeing me awake on the couch because of a fluke involving early-rising children that day. Wondering why on earth some dude just tried to violate my family by opening my front door and strolling into my house at the crack of dawn, I told my kids to stay put and I flew to the front door to confront him as he tried to quietly step off my front porch. I was ready for a fight, or at least a good verbal bashing. This was my family at stake. In confronting him, I found out he was looking for his hung-over friend, who also slept in my car the previous night. From what I could gather, they had somehow mistaken my house for a friend's house in their drunken stupor the night before. I told him to get off my property and let him know my car would not be unlocked in the future. I then called the cops on him. It took three days for the alcohol smell to dissipate in my poor car. I guess my point is we need to be willing and able to do what it takes to protect our families. If it's physical protection they need, we fathers should step up. But most often it will be spiritual protection they require in this society that has, for the most part, lost its moral compass. It won't be easy, whether physical or spiritual, but being a father makes the fight much more plausible to win. Good on you, LL Cool J. I'm pretty sure the momma of your children would've said "knock him out."